Jdrewniak moved T200969: No way to reach the editable version of a page when viewing the most recent mobile diff from Needs More Work to Needs Code Review on the Readers-Web-Backlog (Readers-Web-Kanbanana-Board-2018-19-Q4) board. Jdrewniak moved T220777: Extended testing of Page Previews referenced by `aria-describedby` from To Triage to Needs Analysis on the Readers-Web-Backlog board. Jdrewniak added a project to T220777: Extended testing of Page Previews referenced by `aria-describedby`: Readers-Web-Backlog. Jdrewniak moved T221203: __NEWSECTIONLINK__ doesn't work on mobile web version (can only add new topic by editing last section) from To Triage to Needs Analysis on the Readers-Web-Backlog board. Jdrewniak added a project to T221203: __NEWSECTIONLINK__ doesn't work on mobile web version (can only add new topic by editing last section): Readers-Web-Backlog. Jdrewniak claimed T219895: Style the history page for AMC users. Jdrewniak moved T219895: Style the history page for AMC users from To Do to Doing on the Readers-Web-Backlog (Readers-Web-Kanbanana-Board-2018-19-Q4) board. Jdrewniak added a comment to T220659: Enable a MobileFrontend daily Selenium build. Thanks to @zeljkofilipin 's work today we got a daily job running the Mobile Frontend tests on the beta cluster today. Hurray! However, I still want to edit/write/find a MobileFrontend test that works properly on the beta cluster so that this job doesn't just fail every day. Jdrewniak claimed T220659: Enable a MobileFrontend daily Selenium build. Jdrewniak moved T220659: Enable a MobileFrontend daily Selenium build from Blocked on Others to Doing on the Readers-Web-Backlog (Readers-Web-Kanbanana-Board-2018-19-Q4) board. Jdrewniak added a comment to T220998: Native spelling of Pali on www.wikipedia.org is wrong. Jdrewniak created T220969: Move getAndroidVersion() and getChromeVersion() into Browser.js. Jdrewniak created T220968: Redefine the responsibilities of Skin.js. Jdrewniak created T220965: Decouple Watchstar from Toast and CtaDrawer. Jdrewniak placed T218653: Delete unneeded page-actions menu CSS/JS up for grabs. Jdrewniak moved T218653: Delete unneeded page-actions menu CSS/JS from Doing to Needs Code Review on the Readers-Web-Backlog (Readers-Web-Kanbanana-Board-2018-19-Q4) board. Jdrewniak claimed T218653: Delete unneeded page-actions menu CSS/JS. Jdrewniak moved T218653: Delete unneeded page-actions menu CSS/JS from To Do to Doing on the Readers-Web-Backlog (Readers-Web-Kanbanana-Board-2018-19-Q4) board. Jdrewniak added a watcher for MobileFrontend (MobileFrontend and MinervaNeue architecture): Jdrewniak. Jdrewniak moved T219846: Remove "mediawiki.template.muhogan" from RelatedArticles from Doing to Needs Code Review on the Readers-Web-Backlog (Readers-Web-Kanbanana-Board-2018-19-Q4) board. Jdrewniak moved T219846: Remove "mediawiki.template.muhogan" from RelatedArticles from To Do to Doing on the Readers-Web-Backlog (Readers-Web-Kanbanana-Board-2018-19-Q4) board. Jdrewniak claimed T200969: No way to reach the editable version of a page when viewing the most recent mobile diff. Jdrewniak moved T200969: No way to reach the editable version of a page when viewing the most recent mobile diff from To Do to Doing on the Readers-Web-Backlog (Readers-Web-Kanbanana-Board-2018-19-Q4) board. Jdrewniak added a project to T219848: MobileFrontEnd detects wrong protection level, causing the edit workflow to dead end: Readers-Web-Backlog. Jdrewniak triaged T219848: MobileFrontEnd detects wrong protection level, causing the edit workflow to dead end as Normal priority. Jdrewniak moved T159475: isWideScreen() should only check the width of the device when determining whether a device is wide screen from Doing to Needs Code Review on the Readers-Web-Backlog (Readers-Web-Kanbanana-Board-2018-19-Q4) board. Jdrewniak added a comment to T218154: Provide a focus state to search box. To expand on Jon's point, The reason that there's a flicker on the focus event is because when you click the search box in the header, what actually happens is that a new overlay is created that looks like the header (i.e. SearchOverlay) and the focus is shifted from the first search box to the second overlay search box. Jdrewniak added a comment to T189167: How should we deal with events in MobileFrontend's JS?. Jdrewniak added a comment to T219841: Unknown dependency: mw.externalguidance.init. The patch above removes the "targets" from the extension.json file. I think what was happening is that since the targets were set to "mobile", they weren't being loaded on Minerva desktop. Jdrewniak claimed T159475: isWideScreen() should only check the width of the device when determining whether a device is wide screen. Jdrewniak moved T159475: isWideScreen() should only check the width of the device when determining whether a device is wide screen from To Do to Doing on the Readers-Web-Backlog (Readers-Web-Kanbanana-Board-2018-19-Q4) board. Jdrewniak added a comment to T214549: Reduce height of mobile page issues banner and offset of learn more. @alexhollender it looks like this change is live in production. Do you want to verify this change? ( I ask since it's primarily a design issue). Jdrewniak placed T214549: Reduce height of mobile page issues banner and offset of learn more up for grabs. Jdrewniak updated the task description for T214549: Reduce height of mobile page issues banner and offset of learn more. Jdrewniak added a comment to T215890: Catch up with minerva header changes (id & star). @Pablo-WMDE thanks for your interest here. As you probably guessed, the reason downloadPageAction and others do not use an official Minerva API, is because there is none! Jdrewniak moved T218813: Refactoring Nearby: Remove messageBox template partial inside Nearby from To Do to Doing on the Readers-Web-Backlog (Readers-Web-Kanbanana-Board-2018-19-Q3) board. Jdrewniak reassigned T218807: [Bug] No history button shown on server rendered page (grade C browsers) from Jdrewniak to Edtadros. Jdrewniak updated the task description for T218807: [Bug] No history button shown on server rendered page (grade C browsers). Jdrewniak updated the task description for T219585: Popups' relying on `box-shadow` and `border` combination leads to visual glitches. Jdrewniak added a comment to T216418: AMC Navigation - overflow menu. To expand on that a little bit, I did some preliminary research on the front-end implementation of this feature. The parts of this feature that I focused on were: the HTML/CSS & accessibility. Jdrewniak moved T214549: Reduce height of mobile page issues banner and offset of learn more from Doing to Needs Code Review on the Readers-Web-Backlog (Readers-Web-Kanbanana-Board-2018-19-Q3) board. I think the patch above solves the issue for the most part. Jdrewniak added a comment to T218404: [Bug] Mobile sections should announce their collapsed/expanded state to screen-readers.. The best thing here would be not to collapse the sections at all as screen readers take headings as one possible navigational jump target already. But given technical obstacles that seems out of reach. Jdrewniak claimed T214549: Reduce height of mobile page issues banner and offset of learn more. Jdrewniak moved T214549: Reduce height of mobile page issues banner and offset of learn more from To Do to Doing on the Readers-Web-Backlog (Readers-Web-Kanbanana-Board-2018-19-Q3) board. Jdrewniak updated subscribers of T218404: [Bug] Mobile sections should announce their collapsed/expanded state to screen-readers..
Volker_E awarded T218404: [Bug] Mobile sections should announce their collapsed/expanded state to screen-readers. a Manufacturing Defect? token. Jdrewniak reassigned T204627: Popups: Double pokey on some page preview pop-ups due to SVG mask being larger than thumbnail from Jdrewniak to • Jdlrobson. Jdrewniak added a comment to T219028: [Bug] AMC toggle takes two taps to turn off/on. Same behaviour with the beta toggle. @Pablo-WMDE Good point! Adding ID's on the li level seems useful and cleans up that :nth-child in the jQuery, and probably make the CSS more resilient too. This shouldn't be too difficult to add, I'll try to get something out soon. Jdrewniak claimed T218807: [Bug] No history button shown on server rendered page (grade C browsers). Jdrewniak moved T218807: [Bug] No history button shown on server rendered page (grade C browsers) from Needs Code Review to Needs More Work on the Readers-Web-Backlog (Readers-Web-Kanbanana-Board-2018-19-Q3) board. Jdrewniak moved T218807: [Bug] No history button shown on server rendered page (grade C browsers) from Needs More Work to Needs Code Review on the Readers-Web-Backlog (Readers-Web-Kanbanana-Board-2018-19-Q3) board. Jdrewniak placed T213352: AMC: add history link to actions menu up for grabs. Jdrewniak moved T213352: AMC: add history link to actions menu from Needs More Work to Needs Code Review on the Readers-Web-Backlog (Readers-Web-Kanbanana-Board-2018-19-Q3) board. Jdrewniak added a comment to T218807: [Bug] No history button shown on server rendered page (grade C browsers). come to think of it, I don't think the profile icon in skins.minerva.icons.images.variants is being used in either it's original black or the white variant.I think if we change the profile icon to grey, we could remove the skins.minerva.icons.images.variants module entirely. I've looked into the clock icon usage, and even though it has a grey variant, I don't think the original black icon is actually used anywhere. However, the black version is still being loaded for the skins.minerva.icons.images.variants module. Jdrewniak updated the task description for T204627: Popups: Double pokey on some page preview pop-ups due to SVG mask being larger than thumbnail. Jdrewniak added a comment to T204627: Popups: Double pokey on some page preview pop-ups due to SVG mask being larger than thumbnail. Jdrewniak created T218653: Delete unneeded page-actions menu CSS/JS. You now need 2 (nested) elements if you want to make a h2 a button. Jdrewniak updated the task description for T218404: [Bug] Mobile sections should announce their collapsed/expanded state to screen-readers..
Jdrewniak moved T218404: [Bug] Mobile sections should announce their collapsed/expanded state to screen-readers. from Unsorted to ARIA on the Accessibility board. Jdrewniak added a project to T218404: [Bug] Mobile sections should announce their collapsed/expanded state to screen-readers. : Accessibility. Jdrewniak created T218404: [Bug] Mobile sections should announce their collapsed/expanded state to screen-readers..
Jdrewniak added a comment to T215148: On Phabricator workboard, show status of associated Gerrit patches. @hashar thanks for the tip about the bug parameter! I didn't fix the issue with the multiple bugs on one patch you mention above, but it did make the queries faster. That issue is caused primarily because I'm mapping the patches to tasks 1:1 here, (Array.find) when it should be mapping to an array of tasks (Array.filter). Jdrewniak renamed T218308: Add gerrit.wikimedia.org to the Phabricator CSP from No longer possible to make CORS requests from Phabricator to Gerrit to Add gerrit.wikimedia.org to the Phabricator CSP. Jdrewniak updated subscribers of T217887: Modal to create a new page is missing styles. To be honest I'm surprised the overlay works in Vector at all. It's my understanding that the Overlay component was designed to work with Minerva and MobileFrontEnd, and as far as I know, it's never been used outside of this context. Jdrewniak moved T208605: Remove usage of templates in QuickSurveys: Muhogan approach in RelatedArticles and QuickSurveys is error prone from Doing to Needs Code Review on the Readers-Web-Backlog (Readers-Web-Kanbanana-Board-2018-19-Q3) board. Jdrewniak committed rEQSfa48a1fce907: Removes Muhogan module & templates in favor of jQuery (authored by Jdrewniak). Jdrewniak added a comment to T142527: Page actions should use semantic 'a' rather than 'li' as a button and be tabbable. @Volker_E I can speak to the button vs link. Jdrewniak committed rEQS318392ccfe7f: Removes Muhogan module & templates in favor of jQuery (authored by Jdrewniak). Jdrewniak claimed T208605: Remove usage of templates in QuickSurveys: Muhogan approach in RelatedArticles and QuickSurveys is error prone. Jdrewniak committed rEQS033b7d6aeff2: Removes Muhogan module & templates in favor of jQuery (authored by Jdrewniak). Jdrewniak moved T208605: Remove usage of templates in QuickSurveys: Muhogan approach in RelatedArticles and QuickSurveys is error prone from To Do to Doing on the Readers-Web-Backlog (Readers-Web-Kanbanana-Board-2018-19-Q3) board. Jdrewniak added a comment to T168861: Infobox caption should be properly formatted in the mobile view. There also seems to be a case where a caption is rendering with centered text and padding already, e.g. 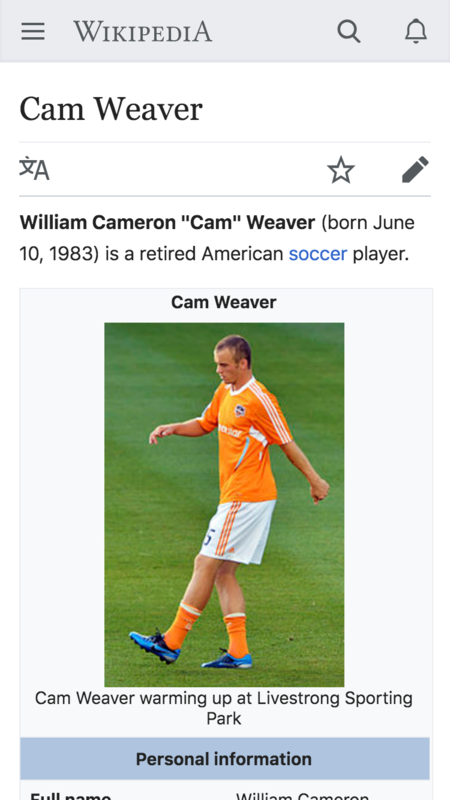 https://en.m.wikipedia.org/wiki/Cam_Weaver. which I do not understand. Jdrewniak moved T168861: Infobox caption should be properly formatted in the mobile view from To Do to Needs Code Review on the Readers-Web-Backlog (Readers-Web-Kanbanana-Board-2018-19-Q3) board. Jdrewniak moved T204627: Popups: Double pokey on some page preview pop-ups due to SVG mask being larger than thumbnail from Doing to Needs Code Review on the Readers-Web-Backlog (Readers-Web-Kanbanana-Board-2018-19-Q3) board. Jdrewniak updated the task description for T213352: AMC: add history link to actions menu. Jdrewniak added a comment to T213352: AMC: add history link to actions menu. The map gadget - you have to be logged in to wikipedia, then (on desktop) under preferences -> gadgets -> check "Add map popups to coordinates in the mobile website" - then switch to mobile, and pages with locations should have the gadget. I think this can be checked by a developer on a local machine, since it involves changes a MediaWiki config file and seeing if the change takes effect. Jdrewniak updated the task description for T217820: Regression: "Expand all sections" setting in Minerva is broken. Jdrewniak moved T204627: Popups: Double pokey on some page preview pop-ups due to SVG mask being larger than thumbnail from To Do to Doing on the Readers-Web-Backlog (Readers-Web-Kanbanana-Board-2018-19-Q3) board. Jdrewniak moved T217820: Regression: "Expand all sections" setting in Minerva is broken from To Do to Needs QA on the Readers-Web-Backlog (Readers-Web-Kanbanana-Board-2018-19-Q3) board. Jdrewniak merged T217660: Links in citation references on mobile lack more contrast (blue on black) into T216961: In mobile view, if a reference contains a link, the link may be positioned improperly in the footnote tooltip. Jdrewniak merged task T217660: Links in citation references on mobile lack more contrast (blue on black) into T216961: In mobile view, if a reference contains a link, the link may be positioned improperly in the footnote tooltip. Jdrewniak added a comment to T216961: In mobile view, if a reference contains a link, the link may be positioned improperly in the footnote tooltip. Jdrewniak moved T217660: Links in citation references on mobile lack more contrast (blue on black) from To Triage to Triaged but Future on the Readers-Web-Backlog board. Jdrewniak triaged T217660: Links in citation references on mobile lack more contrast (blue on black) as Normal priority. Jdrewniak added projects to T217660: Links in citation references on mobile lack more contrast (blue on black): MinervaNeue, Readers-Web-Backlog. I'm adding the Minerva tag since this change can be made to the reference drawer in Minerva. I think Wikimedia-ui-base has an appropriate blue we could use. Jdrewniak committed rEQSf5b7f62a3331: Remove EventLogging schema module (authored by Jdrewniak). Jdrewniak moved T216746: This page is using the deprecated ResourceLoader module "schema.QuickSurveyInitiation". from To Do to Needs Code Review on the Readers-Web-Backlog (Readers-Web-Kanbanana-Board-2018-19-Q3) board. Jdrewniak added a comment to T216547: Make EditorOverlay usable on Firefox by disabling auto-resizing. but that does fix the issue. Removing the input event-binding in postRender however, does not fix the issue, which seems strange to me, because it suggests that event is still firing, but I'm not sure where (on setContent?, I don't see the event in the logs, so I'm not sure if the root cause is really _resizeEditor). Jdrewniak moved T216547: Make EditorOverlay usable on Firefox by disabling auto-resizing from To Do to Doing on the Readers-Web-Backlog (Readers-Web-Kanbanana-Board-2018-19-Q3) board. Jdrewniak added a comment to T216793: Update sans-serif font stack to use system typefaces on www.wikipedia.org portal. FYI I deployed this change today (Monday, March 4 2019) and IMO I think it looks pretty good! The font-change on Mac/iOS/Android is very subtle, but I think the changes on Windows (from Arial to Segoe UI) and on Linux is more noticeable. Apologies for the breaking change. Didn't realize Wikidata made such significant header modifications. The changes were made to give more flexibility to the page-actions menu (and potentially the header as well) and fix some of the unintuitive HTML structure. Jdrewniak renamed T216793: Update sans-serif font stack to use system typefaces on www.wikipedia.org portal from Update sans-serif font stack to use system typefaces to Update sans-serif font stack to use system typefaces on www.wikipedia.org portal.